When it comes to managing your money, we all have the same answer “we don’t know where our money goes”. Because we are not used to of keeping track where we are spending and how much, we hardly notice where we are spending too much money. This is what personal finance management apps help you out with. They let you define your budget, earnings, and expenses and then show you a detailed report on which areas you have been spending more than you need to. This was you will know where your money is being spent. These apps can show you a expense chart of your spending of each month. With this data you can try to budget yourself and make sure you do not spend too much in the coming months. So we started looking for personal finance management apps which can be used easily by everyone. There were lots of these apps that we found in the app store. Here is a list we compiled of some of the apps that work well. 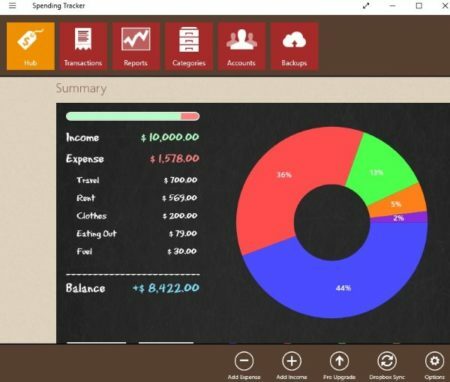 Let’s look at these free Windows 10 personal finance management apps below. MoneyBook is a nice app to manage your finances. The interface of the app is pretty simple as can be seen in the screenshot above. When you start with the app you will get a blank interface with no data in it. You will need to start filling in data using the plus icon given at the bottom right corner. Using the plus icon you can add your income, expenses, or transfers that you have made. As soon as you start entering this data a graph will start forming on the homepage of the app. This graph basically shows your income versus your expenses. You can also make one budget in this app. The settings option of the app will let you access the app in multiple languages. Apart from that you can set password for the app, add new categories, add new account types, etc. You can keep on adding your daily expenses and income to the app. The graph will show you if you are spending more than you are earning. The budget option will keep check on your spending in any particular category. The free version of this app has some limitations like you can add one budget report only, reports can be viewed for limited time period only, etc. You can always upgrade the app to the paid version if you like. But the free version is also good to start with. Money Keeper is a simple app to manage your personal finances. The interface of the app can be seen in the screenshot above. When you start with the app you will have all the fields empty. You will have to start filling in the data with account details and transaction details. But firstly, you would be required to sign in to the app using your email ID, Google ID, or Facebook ID. Once you sign in you will reach this page. Now you can add you income details first. Followed by expense transactions. You can also set out a budget for your expenses as well to keep your spending in check. The settings page of the app lets you change a few things like you can change the default currency, you can change the language of the app, you can set reminders, you can set a passcode to access the app, etc. You can also view various reports using the app. When you click the reports icon you will get some report options that you can choose from. You can generate reports like expense vs income, expense analysis, financial statement, event expense, etc. Spending Tracker is another good app to keep your finances in check. The app is very easy to use with a nice user interface as can be seen in the above screenshot. This is the home screen of the app where you can see a pie chart of your income and expenses. 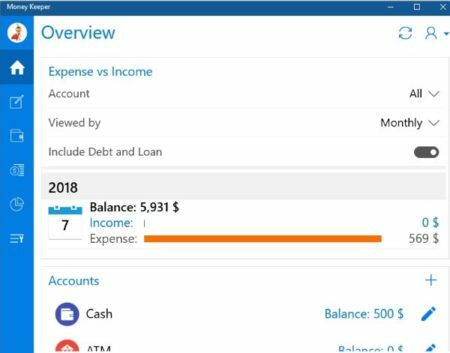 The home screen has the option to add income as well as expenses right at the bottom of the screen. You can start adding transactions in the app using these options. As you add transactions they will start displaying on the home page and a pie chart will also appear on the screen. When you right click on the app window you will see app commands appear at the top and bottom of the window. The commands at the top let you view your transactions, reports, categories, accounts, etc. While the bottom set of commands lets you add new transactions, and gives you options to make some changes in the app. The options field lets you change the currency as require by you. It also lets you see user notes on each transaction, let’s you turn the budget mode on or off, define time period, etc. The Dropbox syncing feature you see on the app is only available with the paid version of the app. 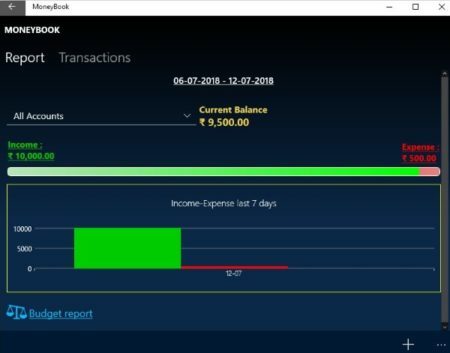 Check out a detailed review of Spending Tracker for Windows 10 here. Expense Spy is a nice personal finance management app. The apps interface is good as can be seen in the screenshot above. In the free version of the app you will not be able to add accounts as they are available in the paid version only. Apart from that you can add your income and expenses. View reports about your transactions. You can also export your data to OneDrive for backup purposes. In the settings window you can choose to a set a password for the app to protect your data. You can also choose to start the app in expense window, show decimal places in amounts, etc. You can check out various kinds of reports from the views section. 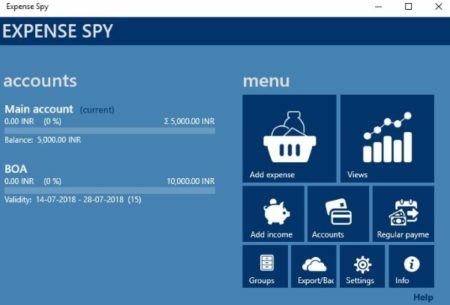 Check out a detailed review of Expense Spy for Windows 10 here. Money Fox is a good app for personal finance management. In this app you will see an interface like the one shown in the screenshot above. You will start with an empty interface. 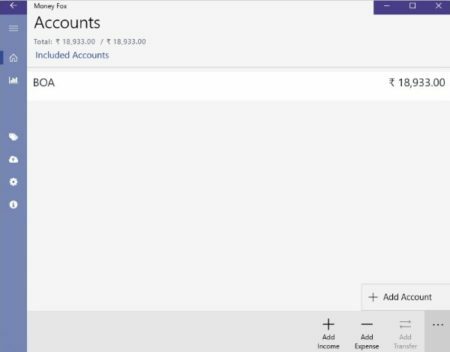 Start with adding a account and entering the opening balance in the account. The start adding income and expenses transactions. The add button for both are given at the bottom right of the app window. The left side menu gives you some options like categories, settings, statistics, home, etc. In the categories section you can add new category of expenses or income like salary, rent, fuel, clothes, etc. The backup option lets you sync your data with OneDrive. You just need to login with your username and password of OneDrive and the backup will be created on it. You can also choose automatic data upload option from settings. Apart from this you can view data statistics through the statistics option. You can view cashflow report, category spending, and category summary. Selffina app for personal finance management is quite handy. It has lots of features to use. The app account page can be seen in the screenshot above. The app start with blank fields. You have to start by adding an account and mentioning the balance in it. Then you can start entering the income and expense transactions in the app. As you enter the transactions you will notice a pie chart forming on the accounts page of the app as can be seen in the screenshot above. The home page of the app will offer you a summary of your transactions in each head and a graph of your expenses and account balance. Apart from this you will get options to set a budget, setup reminders, backup data, add categories, calculator, notes, etc. You also get the option to set a passcode for accessing this app. You can also see various kind of reports through the reports option like income summary, expense transactions, etc. You can also download these reports in Excel format to your computer. 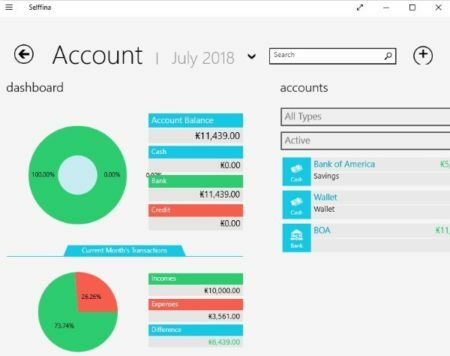 Check out a detailed review of Selffina app for Windows 10 here. These are some easy to use apps to keep track of your personal finances. These apps will help your keep a check on your spending. You can also allot a budget for yourself and try to keep within it. That way you will end up saving a lot of money. Try these apps out and see which ones you like.